As a failed reference-book compiler, I may be the wrong person to write about this 'companion encyclopedia'. A long time ago I was commissioned to edit 'The Penguin Companion to Children's Literature', but after I had sported with the project for twenty years, Penguin Books decided that the whole thing was de trop and pulled out the plug. Nevertheless, those twenty years were something of an education - for the editor, if not the publisher - and the experience may possibly validate my assessment of the fat tome that is the subject of this review. Knowing something of the inner technology of the job I am able to admire the fact that so huge a compilation has come into being so speedily, while being unsurprised that it is a tremendous mess. Mess-potential is already manifest in the book's title, for what the heck is a 'companion encyclopedia'? An encyclopedia is likely to be thought of as a systematically organised body of information providing clear access to the main elements of a subject or group of subjects. A companion may perhaps be thought of as something similar but without the same formality and perhaps without making the same bid for authority. How therefore can both functions be claimed for the same volume? How far does the juxtaposition of the two terms hint at a fracture in the editorial plan? In the event, I am sorry to say, the fracture is altogether more seismic and the book turns out to be neither a companion nor an encyclopedia (and, what is more, only intermittently and casually 'international'). This seems to be something that Margaret Meek discovered when called upon to write her Introduction, for she begins with a gallant defence of the work for having 'a certain deliberate untidiness and openness', and in a succession of obliquely worded qualifications she then attempts to excuse the bumpy ride that many users of the book may experience. Business is most readily apparent in the book's organisation, which is (pace Meek) a 'tour d'horizon'. 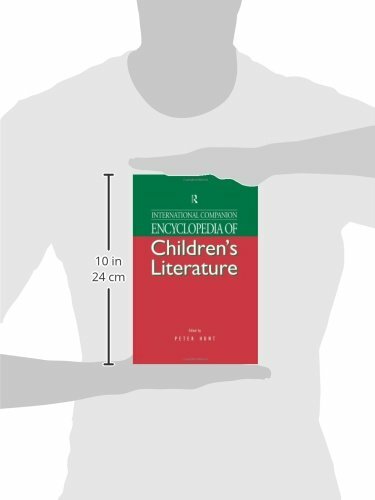 The contents consists of 86 essays by 84 contributors, which proffer a profile-view of children's literature as seen at present. The essays are divided into five main categories: Theory and Critical Approaches; Types and Genres; Context (i.e. subjects like Publishing and Book Awards); Applications (i.e. things like Librarianship and Teaching Fiction, which apparently don't fit into Context); and The World of Children's Literature. I don't want to get bogged down in discussing the many unresolved difficulties which the attempt to be 'international' has posed for the editors. Suffice it to say here that this final section is their chief gesture towards such a laudable, but over-ambitious, aim. It consists of 31 main articles which try with varying success and competence to summarize the progress and present position of children's literature in the countries of the world. But there is no consistency in the presentation of the material, and little attempt is made to take account of the international or comparative aspects of topics in the body of the book. That body leans heavily towards British experience, and not even American affairs are satisfactorily coped with, let alone events in places which are not Anglophone. Quite apart from the lop-sidedness of its emphasis, this anthology approach to Children's Literature makes many problems for itself. The chief of these is what to put where. If (as happens) you decide to have picture books treated theoretically, descriptively (two articles) and as part of several other contributions (Books for Younger Readers; Book Publishing; Book Design; and as part of several historical overviews) then you set up problems of control which may just be surmountable if you are writing the whole thing yourself, but produce nothing but muddle when left to disparate contributors with different abilities and methods and apparently no central guidance. The structure is particularly difficult to defend when you consider that many users of this book will be so unregenerate as to wish to know about personalities rather than categories, so that spreading the treatment of, say, Maurice Sendak through half a dozen articles will deprive such users of a chance to assess a potent influence on contemporary American, English, and 'world' children's literature. (As it is, what you discover about him is negligible. There is nothing about his immensely important work before Wild Things; that book itself is variably dated; there is no assessment of his high-profile post-Wild Things malarkey; and as for such great associate contemporaries as James Marshall and Tomi Ungerer, the first gets no mention at all, and the second mysteriously appears in one line in the (dreadful) essay on France. Some of this muddle could be alleviated by careful indexing, which has not occurred, thus further undercutting any claims for the book's encyclopedic status. And, as it happens, the failure to index properly ensures that a multiplicity of howlers (which a conscientious editor would have spotted anyway) go uncorrected. The Wild Things dates are a minor example, but what can be said of the following? p. 146 'The Contes de F$eAes of the Countess d'Aulnoy, translated as her Diverting Works (1707) became popular...' (not indexed); p.153 'Madame d'Aulnoy's Contes des F$eAes (4 vols. 1710-1715 [i.e. three years after they were said, above, to be translated!]) sowed the seeds ...' (indexed under 'Aulnoy'); p.719 'We should also mention the publication in 1698 [!!] of several collections: Contes nouveaux ou les f$eAes $aG la mode by Marie Catherine Le Jumel, baroness of Aulnoy ...'[not indexed under any of those names]. All this may serve to raise doubts about the authority of this compilation and these doubts cannot but be reinforced by the extreme variability of the level at which its discourse is conducted and the fluctuating balance of its coverage. (These were the problems that preoccupied me during my twenty years chez Penguin.) The most glaring example greets you on entry, where the editor has assembled his most-favoured allies, the critical theorists. For well over a hundred pages we are treated to densely argued (sometimes near impenetrable) accounts of critical postures anno 1996, or thereabouts. Some of these are accompanied by huge lists of references - 74 items for Ideology, 108 for Reader Response -supplied in undifferentiated alphabetic wads. But once you pass beyond this rocky defile, two peculiar things happen: no subsequent article (except 'Metafictions and Experimental Work') is cast in the academy-speak that you met with at the start, and most of the writers on genres etc. appear to have no clue about the very existence of the Theories expounded in Part I. What you get are school-exercises written at varying levels of authority and elegance and exhibiting no consistent effort to achieve a balance between hard information, potted pr$eAcis, and mindless lists. Contrast Denis Gifford's excellent essay on comics etc. (24 pages of detailed and readable exposition) with Marianne Carus's 14 pages of misleading nonsense about Children's Magazines. Feminist contributors are especially guilty of foolish distortions. 'Most anthologies of the past and present are testimonies to the preferences of elite groups of academically educated men' says Morag Styles in Poetry for Children. Has she never heard of Edith Sitwell, or Eleanor Farjeon, or Janet Adam Smith, or Barbara Ireson, or Naomi Lewis? And how 'academic' were Kenneth Grahame, or Walter De La Mare, or the peerless Charles Causley? Obviously, with most of today's pundits among the essayists there are bound to be some successful contributions, but discovering them is a hit-or-miss affair. The misconceived design of the book makes it difficult to use and the good bits are negated by a prevailing casualness, tedium, and, sometimes, ignorance.